Bustling traditional Italian with a front room right out of New York's Little Italy. Soup or salad? The eternal quandary. 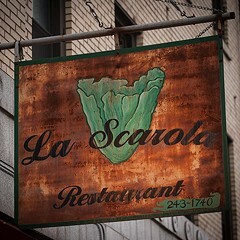 But at La Scarola its one easily resolved with an order of escarole soup, a tasty broth glistening with golden globules of garlic and tender, slightly bitter leaves. 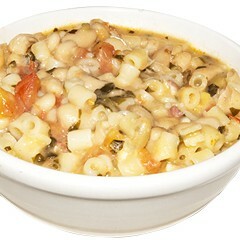 Or you might try the hearty pasta e fagioli, beans and macaroni in a basil-flecked broth that gains heft and complexity from some good Italian cheese. The clams Mondelli here were some of the best I can remember: very meaty, with relatively light breading and a superb tomato sauce. Gamberi risotto--shrimp wrapped in prosciutto with artichoke hearts (canned, unfortunately)--was sprinkled with sun-dried tomatoes for a likable contrast to the lush risotto, and eggplant parmigiana was tender and delicious, the fresh flavor of the eggplant busting through the thin breading. You can get veal here in several preparations, but with meat this good, less is more: the simple chop was outstanding, full of juice and with just a touch of succulent fat around the edge. There's a full bar, and the wine list has many bottles in the $30 range, though there surprisingly few choices by the glass. This is a fun restaurant: the bustling front end looks a lot like a storefront clam joint in New Yorks Little Italy, and they pack em in most nights of the week.